Medium - 19" - 21" Small - 15.5" - 18.5" X-Large - 23.5" - 26" Large - 21.5" - 23"
The Cho-Pat ITB Strap will apply compression at the area of discomfort to help relieve Iliotibial Band Syndrome. 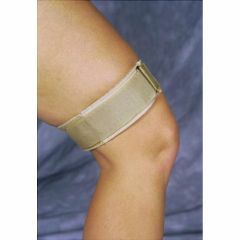 It will help prevent the snapping or friction of the Iliotibial band over the bony prominences just above and toward the outside of the knee joint and/or further up the leg at the hip joint, thus allowing the healing process to begin. However, the ITB strap is not meant to be worn prophylacticly but rather as a temporary device to permit healing to take place. TB35 - Medium - 19" - 21"
TB33 - Small - 15.5" - 18.5"
TB39 - X-Large - 23.5" - 26"
TB37 - Large - 21.5" - 23"
Comfortable to wear, lightweight and helpful to painful area on leg. This is the only strap I've used that does not slip or cause any burning/chaffing. Make sure to put the ITB strap around your leg where the compression eases the most pain. (This is probably the area where you feel pain when you run.) Great Product. IT DEFINETLY HELPED MY PROBLEM!!!!!! DISGUISEABLE. Lightweight. Easy Storage. Safe. Sturdy. Following Surgery. IT WORKS ON PAIN. Elderly. Average Health. IN GOOD SHAPE. by NONE from PHOENIX, AZ. What material is used to make the strap?